Make medicine-time more like treat-time! It can be a real struggle medicating an animal. And as a vet, you know better than anyone how important it is that a pet takes their full dosage prescribed. By recommending to flavor an animal’s medication with FLAVORx, you are not only helping the animal reach the best possible outcome of feeling better but you are helping their owner make medicine time a little less stressful for everyone. 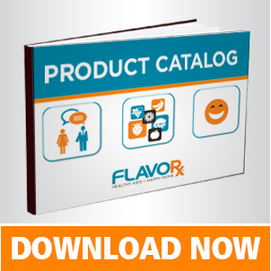 FLAVORx will provide you with everything you need to make the flavoring service successful in your Veterinary clinic. Whether you are treating a diabetic cat or a fussy ferret, this flavoring system will give you the necessary tools to turn their medication into a tasty treat while creating more loyal customers. FLAVORx is available upon request in veterinary clinics across the U.S., Canada, Puerto Rico and Australia. Utilizing our Veterinary Flavoring System, veterinarians dramatically improve the taste of tables, capsule, powders and liquid medications for animals, eliminating the struggle to medicate. Most veterinarian charge a mixing and flavoring fee associated with the flavoring service.